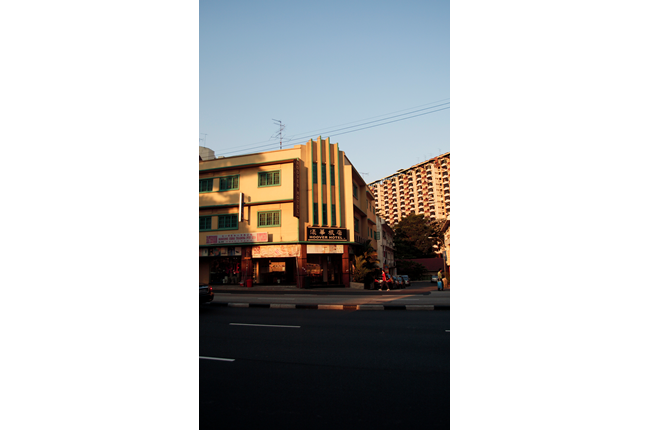 Two noteworthy examples of the Singapore shophouse lie almost right across the road from the Tua Pek Kong Temple: a pair of buildings built in the 1950s in a style known as Art Deco, a style popular in the 1930-50s. Art Deco designs feature clear geometric shapes with an air of subtle sophistication. Structural elements such as arches, keystones and pediments are simplified, streamlined and concentrated at the top or centre of the building. Art Deco influences can be seen in the vertical fins that convey a sense of stature and height to the building housing the Hoover Hotel. Meanwhile, the corner shophouse in its deep brown facade with slit-like windows between vertical fins. The area also used to be entertainment hub with the opening of Ruby Theatre (at the site of the present Balestier Point) in 1958, Hoover Theatre in 1960 and the President Theatre in 1973. In the 1980s, the popularity of home video led to the falling numbers of cinemagoers, so Hoover Theatre was converted to other uses before its closure in 1996. Nevertheless, the name 'Hoover' still survives as other establishments such as Hoover Hotel and Hoover Rojak had borrowed the name. The presence of Shaw Studios and Malay film studio at Jalan Ampas are further testimony to the area's reputation of being an entertainment hub.